Motorola Mobility has today announced the launch of two new Smartphones, the Defy XT and Defy Mini which are water-resistant, scratch-resistant, dust-proof, and feature large batteries for amplified battery life. The Defy XT is a 3.7 inch Android 2.3 Gingerbread running smartphone while the Defy Mini comes with a 3.2 inch and dual-SIM slots to let you use have more connectivity on the go. Both the Defy XT and Defy Mini feature the Corning’s Gorilla Glass which is scratch-resistant and is known for its toughness too. Both the smartphones are the first smartphones in India to feature MotoSwitch, a handy user interface which learns the songs you love, who you talk to most and which apps you get the most mileage from. It then cleverly collects all your preferences and stores them, which means you’ll be so organised you’ll have loads of extra time on your hands. The Defy XT and Defy Mini come with a powerful 1650mAh battery which will keep you going all day long and is said to give you 9.5 hours of talktime on the XT while 9 hours of talktime on the Mini. Starting June 20th, both the smartphones will be available in market for the price of Rs. 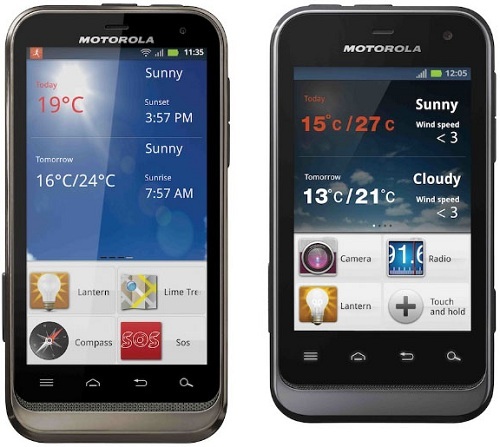 16,190 (MRP) for Motorola Defy XT and Rs. 11,490 (MRP).